Remembering your brothers with two buttons on your uniform. Molly Caughey never went to war, but that didn’t mean that she didn’t feel the effects of it first hand. Molly was a foundation student at St Cuthbert’s College. Although the girls of St Cuthbert’s couldn’t serve themselves, they had a special way of honouring those at war. Students sewed a red button on their uniforms if they had a family member serving overseas. That red button was turned to white if their family member died while serving. Two of Molly’s older brothers, Andrew and William (as well as Molly’s close friend and future husband, Henry Hugh Blackwell) left to serve overseas. Molly was only a teenager and she had already lost three important men from her life. As a schoolgirl, Molly did as much as she could to help, she raised money, studied nursing and still managed to keep on top of her studies, eventually becoming Head Girl in 1918. When the Armistice was signed in November 1918, Henry and both of the Caughey brothers had survived. Molly would have been so relieved. But only one Caughey brother made it home to New Zealand. William was a victim of the influenza epidemic which swept the world at the end of 1918 and died with Andrew at his bedside. Molly changed one of her buttons to white. You have been given Molly's buttons that she wore on her school uniform as well as the St Cuthberts School Roll of Honour. You are now tasked with discovering more of the story behind her brothers - Andrew and William Caughey. How much of his story can you piece together? The suggestions below will help you on your research journey. The How We Find It Fact Sheet will also be a helpful tool in helping you discover the pieces of the brother's puzzle. You're in luck. Andrew and WIlliam both served in the New Zealand Army so their records can be found online at the Auckland War Memorial Museum Cenotaph. This is your most important search. Collect as much information as you can. Once you've found Andrew and William's Serial Numbers move to Archway and search for their service documents there. Now that you know what happened to the Caugheys, download and look at the Roll of Honour. St Cuthbert's was, and still is a girls' school so their Roll of Honour was not made up of former students but instead brothers, fathers, uncles and fiances. What happened to the men on this list? 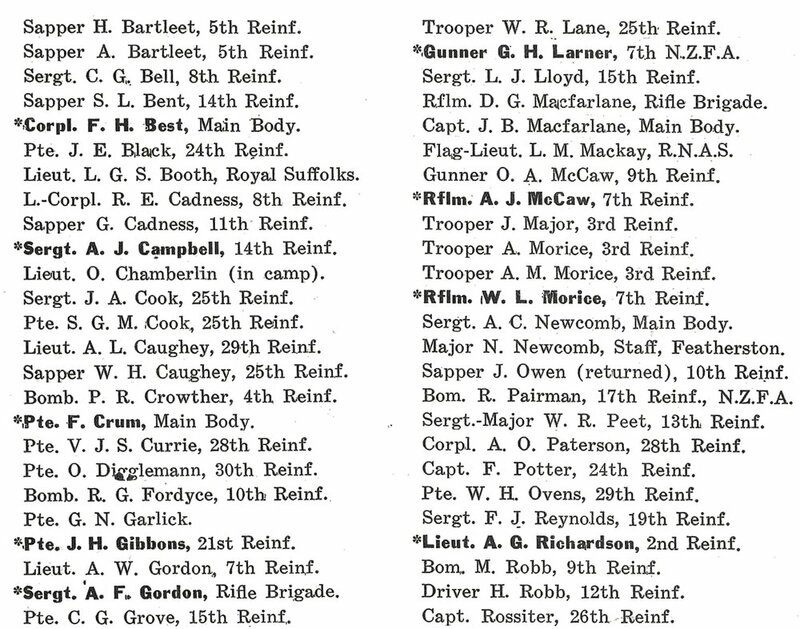 Use Cenotaph to find out how these men ended the war and find their photos. Molly Caughey was the daughter of Andrew and Lucy Caughey. Her family owned the Department Store, Smith & Caughey (which is still a prominent department store on Queen Street today). Molly and her brothers grew up at Rahiri House (Andrew uses the address for his next of kin on his history sheet). Use Google to discover what became of the beautiful Rahiri House. WHY DOES WILLIAM HAVE A MEMORIAL TO HIM AT WESLEY COLLEGE WHEN HE DID NOT ATTEND THERE? William Henry Caughey's Cenotaph record contains references to Auckland Grammar Mt Albert War Memorial Hall, Mt Albert Methodist Church and Mt Albert Methodist Church Sunday School holding Rolls of Honour that carry his name. Interestingly Wesley College also has a war memorial in William's name. Can you find out what type of war memorial it was? What beliefs was Wesley College founded on? Why would the Caughey family decide to erect a memorial at this school specifically (and one that William had not attended)? The biography of William's Aunt, and donor of the hospital may give you a clue. MOLLY WAS HEAD GIRL IN HER FINAL YEAR AT ST CUTHBERT'S. WHAT DID SHE DO AFTER SCHOOL? Molly Caughey (remember her actual name was Jean Kathleen Caughey) had attended Nelson College for Girls before becoming a foundation pupil at St Cuthbert's opened in 1914. She was appointed Head Girl at St Cuthbert's in 1918 but had to leave school due to sickness during the year. What happened to Molly? She was a member of a very prominent Auckland family and the war and the death of her brother must have had a huge impact on her life. how did other girls' schools across new zealand acknowledge the war's impact ? In the context of Girls' Schools, the wearing of buttons on the St Cuthbert's school uniform was an unusual (though quite poignant) acknowledgement of the losses and worry that its pupils were enduring on a daily basis. Other Girls' Schools across New Zealand chose to mark or contribute to the war effort in many different ways. Use Papers Past and narrow the timeframe of the search to 1914-1918 to discover how schools such as Otago Girls' High School, St Hilda's Collegiate School, Waitaki Girls High School, Auckland Girls Grammar, Christchurch Girls' High School and Nelson Girls' College acknowledged the war. In 1921 a Caughey - Blackwell engagement is announced and then two months later a Blackwell-Caughey engagement. Who were the Blackwells? What was their family business? Given the Caugheys' family buisness, how might the Caugheys have known this family? Buttons and a Roll of Honour are connected with the story of Jean Kathleen (Molly) Caughey, Andrew Leonard and William Henry Caughey who attended Nelson College for Girls and St Cuthbert’s College and Auckland Grammar School. The original buttons are held by St Cuthbert’s College Archive.This story is told with the permission of David Blackwell, David Caughey and Richard Caughey on behalf of the Blackwell and Caughey Families. The Caughey Brothers worked at the family drapery. The Walking with an Anzac Team found the first clue in The Caughey Brother's story when they visited St Cuthberts School. The school archives are rich with documents, stories and photographs from the school's founding days. Further research on the same platforms you have used today allowed us to discover The Caughey Story. Andrew's handwritten Service Records can be found on Archway here. Research starting points for the Caughey Brother's Story.